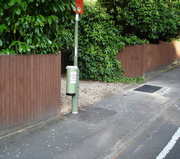 Along the roadside and at intervals on the walk home, Zilch mini-bins provide the public with an easily-reached place to extinguish and deposit their cigarette ends or to discard rubbish. They provide you with a cost-effective and convenient way to provide a facility for them to do so. 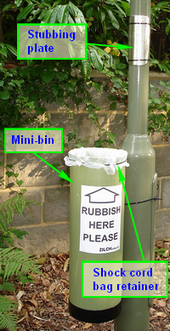 Mini-bins are designed to be mounted on lamp post or other uprights at a height that makes them both visible and easily accessible. This is elastic cord is optional and is use to help prevent the bin liner from being blown away. This a piece of curved aluminium punched with holes through which the ties are passed. Being vertically mounted this plate is self-cleaning when rained on.